Cryosurgery for Morton's Foot Neuromas: An Option, but Not a Miracle! Cryosurgery for Morton’s Foot Neuromas: An Option, but Not a Miracle! He adds, “What should have taken a couple of weeks to ‘get back out there’ has taken months.” He says he didn’t start running until 3.5 months later — and even then, he was walking on his heels to avoid putting pressure on the balls of his feet. “Now I have a bad case of plantar fasciitis in both feet because of it,” he says. Stories like this are not uncommon. Cryosurgery for foot neuromas CAN be a good option for some patients, but not for all. In this article, we’ll discuss the topic openly and honestly to help you decide what might be best for your case. Who Should Consider Cryosurgery for Morton’s Neuroma? – You have been diagnosed with Morton’s Neuroma. Chronic cases of heel pain, fibromas, and tarsal tunnel should be treated with EPAT or laser, rather than cryosurgery. – You have tried conventional therapies. Rest, changing your shoe type to a wider toe box shape, using orthotic devices to relieve pressure, and taking anti-inflammatory painkillers are usually the first courses of treatment. The goal of cryosurgery is to avoid major surgery. Yet, at the end of the day, it is still surgery. 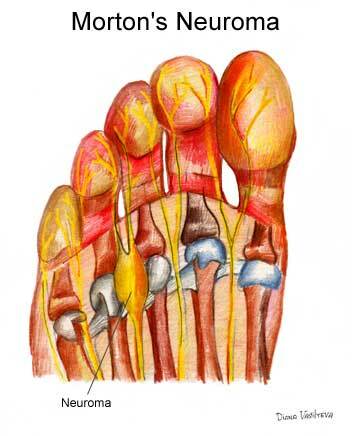 Cryosurgery can help with foot neuroma’s. It’s important to remember, however, that although it’s minimally invasive, it’s still surgery! – You have not had previous surgeries on your neuroma. The “freezeball” cannot penetrate scar tissue, so you will not likely encounter any relief from cryosurgery following traditional surgery. Alcohol injections may also decrease the effectiveness of cryosurgery. – You understand there is no guarantee. Few scientific studies have been published about using cryosurgery to treat Morton’s Neuroma, but we find it helps about 80% of the time. Studies cited in Podiatry Today have recorded an end to complete pain in anywhere from 39% to 82%. Cryosurgery freezes the nerve; it does not kill it completely. However, it does reduce a patient’s sensitivity and make the condition more tolerable, which is as close to “victory” as can be expected. The unfortunate truth about painful foot neuromas is that there is always a chance they will rear their ugly heads again. What Are the Risks Associated With Cryosurgery? Side effects are rare, but may include: infection at the incision site, swelling, bruising, prolonged numbness, soreness, and scar tissue formation. The worst “side effect,” though, is disappointment. Some patients may not receive immediate reprieve from foot pain. In rare cases, the pain worsens. Most commonly, cryosurgery will work for a time but returns months or years later when the nerves have regenerated. What is Cryosurgery Recovery for Foot Neuromas Like? Every case is different, but generally speaking, you should feel at least 40-60% better from pain within two to six weeks. Healing can be expedited by decreasing your activity, stopping your workouts for at least three weeks, wearing a surgical boot and pad during that time, applying ice for 15 minutes at a time several times a day for the first week, wearing orthotics, and using anti-inflammatory medications as needed. Where Can You Get Cryosurgery in NYC? Cryosurgery has been performed by Dr. Geldwert and staff for neuromas for five years.”The results have been encouraging . Cryosurgery is performed as an in office ambulatory procedure under ultrasound guidance and is approximately 65-70% successful in relieving the pain associated with neuromas,” says Dr. Geldwert, DPM.